Rom Whitaker founded India’s first snake park in Madras in 1972. The park received early support from the World Wildlife Fund and other international organizations for its pioneering research and work in conservation. In 1976, Rom co-founded the Madras Crocodile Bank, after realizing that three Indian species of crocodiles were on the verge of extinction. The Crocodile Bank is now home to 3,000 crocodiles of 15 different species, and is also the base of a major freshwater turtle project supported by the Turtle Survival Alliance (USA), and a gharial conservation project, supported by the Gharial Conservation Alliance. Whitaker has published widely and made dozens of films. Most recently, he set up India’s first rainforest research station in Agumbe, for which he was rewarded the Whitley Fund for Nature award in 2005, and a Rolex Award for Enterprise in November 2008. Q: How did you become interested in reptiles? A: I spent my childhood in northern New York State and like many kids, bugs and other critters fascinated me. My first encounter with a snake was one that was battered to death by my little friends. I took it home in a jar and remember how horrified my sister and mother were that the poor little guy was smashed. The next time I found a snake I brought it home alive, and my mother helped me fix up an old aquarium as my first terrarium — I was hooked. Luckily there were no venomous snakes around Hoosick, NY so I amassed quite a collection of milk snakes, garters, ribbons and ring-necked snakes. My mother bought me The Boy’s Book of Snakes and later Snakes of the World by Raymond Ditmars, took me to the NY Natural History Museum and in general, fostered an interest that grew into an obsession and, of course, eventually my occupation. Could you describe your creation of Madras Snake Park in India? When I returned to India in 1967 after two years in the US Army, my goal was to set up a snake park like the one I worked at in Miami: the Miami Serpentarium run by the famous, most snake-bitten man in the world, Bill Haast. I started out by producing and selling snake venom, the idea being to build up capital for the project. I was sourcing snakes, particularly kraits, all over India and came to know of this fantastic tribe of snake catchers, the Irulas, living near Madras in the southern state of Tamil Nadu. After seeing their artistry I just wanted to work with them, learn from them, and involve them in my developing ideas. I moved to Madras and rented a piece of land with an old house on it quite far from the city. My brother Neel, sister Nina, and my Irula friends helped me make the first snake enclosures, put up a board and get some newspaper publicity. Thus was born India’s first snake park. This was in 1970, and two years later the Tamil Nadu Forest Department gave me a 25-year lease of a piece of lovely scrub jungle right in the heart of the city. The new Madras Snake Park was an overnight success and soon we were getting a million visitors a year! Is it true that you used to wear a sand boa coiled through your hair in those days? Yes, I guess I was a pretty strange sight, a wild-haired hippy snake man with a three-foot-long sand boa tangled in my hair as I rode around on my motorcycle; it was all good for publicity though, and there were a lot of good spin-offs, including early support from the World Wildlife Fund and a couple of local and international awards and recognition for pioneering work in the subject. Could you describe your creation of the Madras Crocodile Bank and the work it does now? In the early days of the Snake Park we collected a few crocodiles and, lo and behold, they started breeding in the small enclosures we had for them. By then we were doing herpetology surveys in different parts of the country and it became obvious that the three Indian species of crocs were going extinct. I was then married to Zai Whitaker, the daughter of one of India’s best-known conservationists Zafar Futehally, and together we started the Madras Crocodile Bank in 1976. Located on the main tourist route outside of Madras (now Chennai), it got a lot of publicity and visitors from the start. We had 14 mugger crocodiles, five saltwater crocodiles and two gharials, plus an American alligator at the start. Now, 30 years later we have 3,000 crocodiles of 15 different species. This was the only private crocodile-breeding center in the country, and the largest. What was it like to swim in the cave, searching for the olm? Swimming in that water, a mile beneath the earth’s surface was a bit unnerving, but I was more worried about freezing to death. I may have Viking genes, but I’m totally tropicalized and stripping down to put that wet suit on and slipping into that frigid water was not my idea of fun. The only thing that made it worth it was finding those olms. It didn’t take long to spot one, but the water kept getting murky from my clumsy movements so it took a very long time to finally bring one up in the hand net, and each minute I thought I would freeze to death. Just for fun we turned off all the lights for a while down there and that was a strange, unbalancing experience; we could just imagine how it might be to be early cave explorers with unreliable lights that might fail! You have survived several venomous snakebites. How? First, I’d like to make it very clear that getting bitten by a venomous snake is dumb, clumsy and nothing to be proud of. Each of my bites has been because I did something stupid, like the first, a water moccasin that I was pinning on a log in the Everglades; the log went under as I was reaching for the snake’s neck and it turned at the last moment and nailed me nicely. This one and the subsequent two rattlesnake bites out in Texas (during my US Army days) were painful and in the case of one, debilitating: my right forefinger is permanently stiffened and numb. How did you discover you were allergic to modern antivenom? When I received antivenom for my second bite I reacted very badly with itchy hives all over my body and spent a very uncomfortable two days recovering just from the treatment. If I get bitten now I can’t take the antivenom without a ‘cover’ of antihistamines. In 2006, on a film shoot involving crocodiles, I stupidly tried to help a snake get across a road full of traffic and in the melee got nailed on my thumb. Well, I had to chase the snake to figure out what it was and it turned out to be a black whip snake, venomous but not fatally so. A big swollen hand resulted, which is very embarrassing when you’re supposed to be catching crocs and presenting a film. I had to keep my hand hidden for a few days till the swelling subsided. Had you been whipped by a water monitor tail before? I’ve had lots of encounters with water monitors and lots of whips, that’s just par for the course when you work with these critters. You do have to be careful not to get whipped in the face; I reckon it could put an eye out if you’re unlucky. Were you surprised when the Komodo dragon started chasing you? I really had no idea that Komodos would actually chase a human, but then again, why not; we must be as tasty as a deer. This was truly a surprise, and I’m glad the local guides insisted that we carry a forked stick with us and that we shouldn’t walk around alone on the island. Did you have a favorite or unexpected moment while shooting The Dragon Chronicles? I think the most unexpected moment was being chased by the Komodo dragon. The other startling revelation was the dragon’s immense power and stamina. I’m used to crocodiles: they’re very powerful but they run out of steam very quickly when you are capturing and handling them. The dragon we caught for our saliva tests just didn’t tire and his recovery time after we released him was just seconds! What was the most exciting location for you and why? Each location had its excitement and uniqueness. Certainly the Komodo dragon experiences were the most action-packed, but being down in those beautiful caves of Slovenia, slopping through the mangroves of Sri Lanka, getting within touching distance of wild Nile crocodiles in Ethiopia, climbing the Indian rain forest canopy looking for flying lizards, and watching the marvelous spitting cobra do its thing—I loved all of it! Describe some of the more difficult or frustrating moments of shooting. Typically, the most frustrating times were waiting for permissions from local authorities to allow us to get on with our work. But by and large both people and creatures were remarkably cooperative on this entire film shoot. 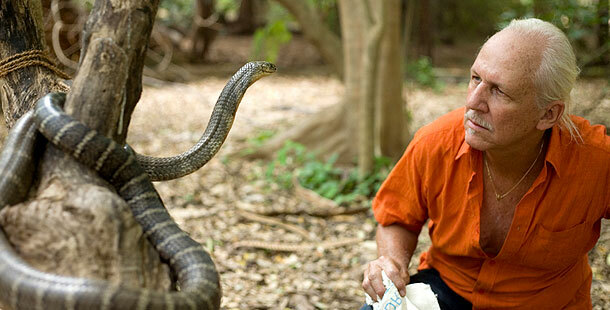 What are some of your favorite moments of handling snakes and crocodiles throughout your career? I could be described as a very lucky puppy, having spent much of my life in this beautiful and sometimes surreal country of India, almost three years on the island of New Guinea, months in the depths of Borneo, Mozambique, Costa Rica, the American southeast and southwest, and always in pursuit of fantastic reptiles. One of the most decisive moments in my life was finding my first king cobra at Agumbe, where we’ve just set up India’s first rainforest research station. I’ll never forget the feeling of facing that magnificent 12-foot-long snake all by my lonesome and the somewhat crazy maneuvers that it took to get it into a bag. Similarly, there are hundreds of fond and exciting memories of hunting rattlers in the hills of Arizona, moccasins in the Florida swamps, and saw-scaled vipers in the Rajasthan desert. I’m 65 years old and instincts (and some well-meaning friends) say I should slow down and maybe take it a little easier, but how can I? What can humans learn from the “dragons” featured in the film? Years ago it was pretty hard to get people to empathize even a little bit with scaly, cold-blooded critters; now, thanks a lot to good PR from television, it is easier to get the message of reptile conservation and tolerance across. We have a lot to be thankful to reptiles for, not the least of which is their control of rodents. But besides their utility on the planet, our remaining dragons are needed to excite our senses, to fill every generation with renewed wonder, and to keep us alert for that predator lurking just around the corner! Photo © saravanakumar/Icon Films Ltd.